This is White Flower Oil - Analgesic Balm - 10ml/.338oz. A pack of ten bottles. White Flower Analgesic is made from a traditional blend of aromatic herbs such as lavender and mint, which heal headaches and minor pains made worse from poor circulation, inclement weather, or unwise dietary habits and addictions. 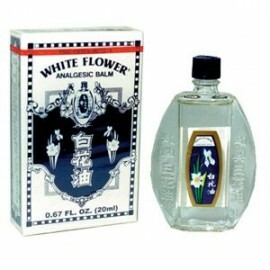 White Flower Analgesic oil or balm can be inhaled to help clear sinus congestion. Directions: For headaches, apply with clean cotton to temples, forehead, neck, top of the head, or any painful area while carefully avoiding the eyes, mucus membranes, sensitive tissue or broken skin. For sinus headaches, inhale White Flower Analgesic holding the bottle a few inches from the nose or apply one drop under the nose with a cotton swab. Contents: Active ingredients: Wintergreen 40%, Menthol 15% and Camphor 6%. Inactive ingredients: Eucalyptus 18%, Peppermint 15% and Lavender 6%. 0.67 Fl. oz.